Get instant access to this powerful industry-recognised e-commerce business certification program. This online course combines cutting-edge e-learning with 6 downloadable course books, and time-saving e-commerce planning templates. Get instant access to this powerful industry-recognised e-business management certification program. This online course combines cutting-edge e-learning with 6 downloadable course books, and time-saving planning templates. Want High-Quality Printed Books with E-Learning? Get this powerful industry-recognised e-business management certification course. Thislimited edition box set combines cutting-edge e-learning with 6 high-quality printed course books, and downloadable time-saving planning templates. 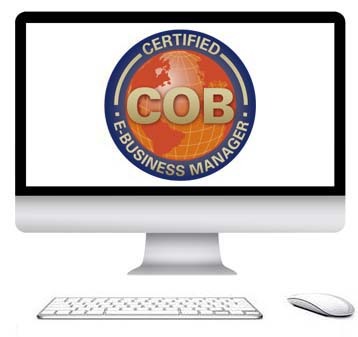 Get this powerful industry-recognised e-business management certification course. This limited edition box set combines cutting-edge e-learning with 6 high-quality printed course books, and downloadable time-saving planning templates. 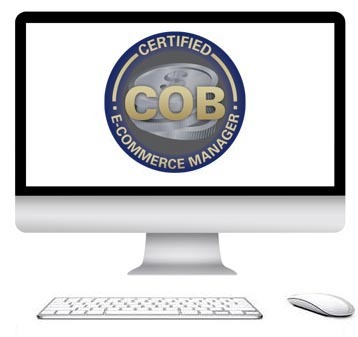 Get the COB Certified E-Commerce Manager Course exclusive web merchandising training as an add-on to the COB Certified E-Business Manager Self-Study Course. 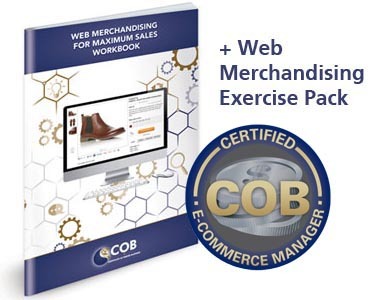 This pack includes the Web Merchandising for Maximum Sales high-quality printed book, web merchandising exercise pack and access to the offical COB Certified E-Commerce Manager Web Merchandising e-learning and exam practice exercises.